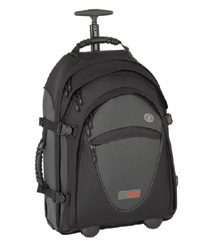 Robert Scoble did a post on his blog about his bag. Given the fact that I am needing to carry more stuff around lately and have had problems with my back carrying around my current bag, Robert’s post pushed me over the edge! I went out and ordered the same bag. I had to special order it, but it should be at the store tomorrow. I’ve been doing quite a few 1to1 sessions at the Apple store lately. Mostly on Finalcut Express. I’ve learned quite a bit about it. I recently took a 1to1 on Garage Band. Got that pretty much down. If I want more I will have to migrate to Logic Express or Pro. I think Garage Band will meet my needs for now. I’ve begun the process of getting my college transcripts to Devry. I plan on finally getting a bachelor’s degree. I want to finish what I started years ago! I entered a contest on Youtube to win a $300 light-kit. I didn’t win but it was allot of fun and I learned allot in the process. I got filler pages for my Franklin day planner. I think I now have the impetus (the fire in my belly) to put the thing to good use. Basically, to keep track of my schedule and the things I want to accomplish. The wife and I just celebrated our 6th. Took an extra day off and went to the zoo. Very enjoyable day. I’ve been able to be more mentally engaged. Though far from perfect. I am seeing improvement here and it is encouraging. Went to the July Cocoa-Head users meeting in the Apple store. was okay. Also signed up for the Chicago iPhone Dev Camp that will be in August. I need to devote some more time to this. I need to be spending more time reading through the on-line documentation. There’s so many things rattling around in my brain right now (as usual) and its hard to know what to pick out to talk about. And I want to write. Many times during these brain log-jams, I just throw in the towel and I don’t write a thing. I think the best thing to do is start typing. Just start typing into the blog. My attempts at programming the iPhone are kinda so so. I have fits of programming attempts. My main road-block seems to be learning how to use XCode properly. I’ve talked to people who work in the Oakbrook Apple store and the big Michigan Avenue Apple store in downtown Chicago. Not suprisingly, beyond knowing how to use the iPhone, they don’t have any info/help on how to program the thing. Gosh, I wish I had gone to the developer conference Apple just had in San Fran! I didfind out about a programmer’s group in the Chicagoland area that meets once a month at the Michigan Avenue Apple Store. The Cocoaheads. I saw some stuff out there about iPhone programming. I am planning on going to their July meeting. Wish me luck! I finally took my first 1to1 course at the Apple store on Finalcut Express. Pretty good! Sadly, I’ve had the membership for a while now and have wasted several weeks. I am all signed up for another 1to1 though. Are you an iPhone developer? Do you know XCode pretty well? Do you mind if I bother you with questions? Let me know. Bring to that meeting in July. To give via email addresses shown at the end of the Apple “how-to” videos. Taking B Vitamins & Magnesium. Trying to recollect what I did right for the day not what I did wrong. Trying to recollect what I completed, as opposed to what I didn’t complete. Not only let my body rest, but my thoughts rest too. One thing that has been therapeutic, has been gardening. I’ve created this whole new garden bed in my back yard. It’s got this nice edging, cedar mulch, and I’ve planted 3 new bushes! I hope that they survive. The bushes have some new holes in allot of the leaves. I looked on the underside of the leaves… no bugs were found. I’ve now added flowers and garden lights to my garden bed (some flowers have not been planted yet). Oh, and I have one tomato plant. Visited my dad at the nursing home. He was quite lucid. Haven’t seen him that lucid in quite some time. I know its not something I can expect regularly. If I had my druthers, I would live by the ocean in Hawaii and my dad would live with us and we would have in-home healthcare for him. I don’t know if my dad would live long enough for this to happen. I can dream. For some people like me its hard to complete things. The mind can be this heaving ocean that floods the corners of my skull with all sorts of ideas. Some seem very cool! The frustration starts when I try to decide which ones I’m going to pursue and put some energy into. My mind wants to move around. So its hard to work very long on one idea. That’s a struggle too since I tend to eat bad food, drink pop as a comfort to my frustration (I hear processed sugar can work like an opiate in the brain). The Kinoki pad testing is slightly stalled at the moment. I’ve fallen behind on my Six Sigma class I’ve been taking, and I’ve not done any work on the project with my sister for awhile. Part of the blame could be placed on panic attack symptoms I’ve been having of late. These have dissipated as I’ve gotten back to being more disciplined in my eating habits and excercise. I’ve had to really struggle to get back to some half-way decent baseline. Last Friday night I talked myself and my wife into buying FinalCut Express for my Mac. I was excited about some of the post-production problems I hoped it would solve. Naturally, after installing it the program would not work. The splash screen would come up and then the program would silently end… without any messages or anything. That was very discouraging! I tried everything I could think of… I Googled for information, tried a few things, no dice! Finally I called Apple. Guess what Steve, it doesn’t always “just work!” I waited about a half and hour on hold. Yuck! Finally, I got through and, working with the guy, I was able to get FinalCut Express working. Whew! Let’s see, I’ve done no work on Chomer.com, or any of my other forward looking projects. But I won’t quit! I want to write a post soon on what’s important in life. I signed up for a Six Sigma Green Belt course that you take on-line. It officially began February 1st. I just really started getting serious about it last night. I’ve got to get off my mental couch and get cracking! Tonight is the first “live” class. This will be happening every Tuesday night for the remainder of the course. The rest of the lectures are videos with accompaning slides. The course also came with a thick binder with more information on each module. I am trying to take notes in a way that the notes could be the starting point for creating my own Six Sigma “prep class” on Chomer.com! It’s just an idea… we will see where this will go! When I got home last night I was hoping to get at least one item of the three that I am expecting. But to no avail. Sigh. The book I didn’t really expect since I just ordered it. But I’ve been waiting awhile for the other items.